If you've ever had to pay for brake servicing, then you probably appreciate the value of learning how to repair brakes yourself. Brake repairs represent one of the most common vehicle services performed by automotive technicians, and this is also often the one service that is particularly overpriced. 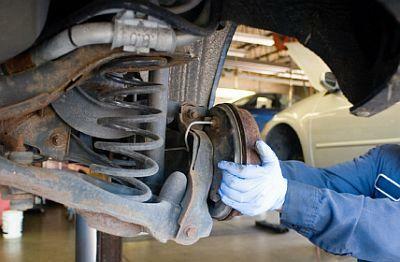 If you learn how to fix your own brakes, you could stand to save a small fortune. If your brakes are starting to make a high-pitched screeching sound, like metal-on-metal, then you only need to replace your brake pads. While other brake servicing may require more involved work and a trained mechanic, replacing brake pads is an automotive repair that you can do yourself without too much effort. Brake pads wear out. That's just the nature of driving a car for many years. Everyone knows that brake pads are going to wear out eventually, but no one really enjoys how much it can cost to have brake servicing done. The following procedure will guide you through the task of replacing your own brake pads. Once you do it, you'll realize that it's nothing to be afraid of. Note: While older vehicles used to have "drum" brakes, most newer vehicles come factory manufactured with a disc braking system. This procedure assumes that your vehicle has disc brakes. Make sure that the screeching sound you hear is actually the brake pads. 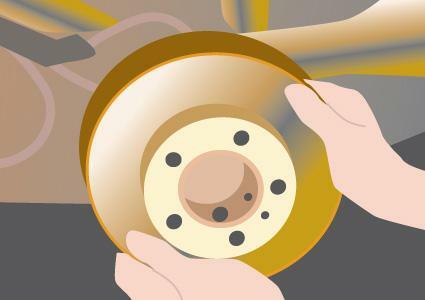 Look through your wheel well (or jack the car up and remove the wheel if you have to) and examine the pads that are snug against the metal rotor. Generally, if the brake pad is between a quarter inch to an eighth of an inch thick, you should replace it. If you do replace one pad in the front or back, make sure to replace both to ensure even wear. Park the car in a clean, dry place. 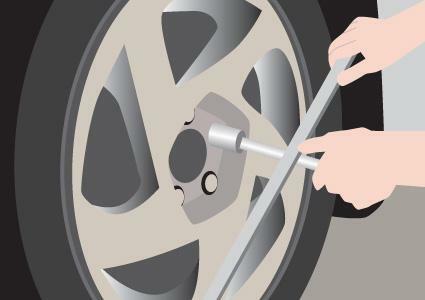 First, loosen all lug nuts for both front wheels using the tire iron that came with your car (in the trunk). Either ride the car up on wheel ramps, or jack up the front of the car using two car jack stands. Always be sure to place blocks behind the rear wheels, and make sure to only use the jacks against the solid frame under the car. The brake pads are held just above the rotor by the brake caliper. You'll see each pad attached to the caliper with clips or a bolt. Remove the clips or the bolt and detach the pads from the caliper. Rub the rotor with your finger to check for any grooves or scoring. Make sure the rotor isn't hot before you touch it! If there are grooves, you should also remove the rotor for replacement as well. Once you've removed the brake pads, and potentially the rotors, from each wheel, you're ready to go to the auto store to purchase new parts. Bring everything with you. At the auto store, talk to the staff and provide the make and model of your car. Also show them the brake pads and the rotor that you've already removed. They will match the parts to those that match your vehicle. Also pick up a packet or two of brake pad grease. When you get back home, you'll need to readjust the caliper so that it is wide enough to hold the new, thick brake pads. Reach in back of the caliper and feel for a three-inch metal piston. Using vise grips, push this piston back toward the car until the piston is flush with the metal housing. Once the caliper is reset, reinstall the new rotor in place of the old one. When you install the new brake pads onto the caliper, make sure to spread some of the grease between the plate and clips and the brake pad itself. After you've installed the new rotors (if you had to), and reassembled the new brake pads mounted back onto each caliper, you've finished the job! Carefully lower the car back to the ground, remove the blocks from the rear wheels and go for a test drive! On your test drive, don't worry about some of the strange screeching sounds you may year. Occasionally, those slight sounds fade in time. If the sound is very loud or you notice major vibrations or other problems as you drive, you may need to take the car to a mechanic to check out your handiwork. Make sure to ask the mechanic if you can watch so that if you did anything wrong, you can learn the how to repair brakes the correct way. That way, the next time you need to change your brake pads, you'll do it perfectly.